The fourth quarter witnessed a significant downturn for equity markets as well as a decline in energy prices. These downturns were in contrast to strong corporate earnings growth, estimated GDP growth of 2.7% and continued high demand for oil. The equity market downturn was widespread, however value stocks, which had trailed growth during the year, had less severe declines, but declined nonetheless. International stocks, including emerging markets, had substantial declines in the quarter contributing to full year results that significantly underperformed domestic stocks. Commercial real estate remains stable while residential real estate weakened, as mortgage rates slightly increased. This also depended on local market conditions. For the most part, our defensive and traditional equity strategies fared well in that most met or exceeded their respective benchmarks during the quarter, despite almost all experiencing a significant drop during the quarter. For the full year, all but two of our many defensive and traditional strategies met or exceeded their benchmarks. Quality, for the moment, did not seem to matter. Strong earnings growth, for the moment, in our portfolio companies for the most part did not matter (there were some exceptions). Better than targeted dividend growth (13.9% on average for the year) in our Dividend Growth Strategy, for the moment, did not matter as well. Overall, when looked at over the two year period of 2017 and 2018 our approach to asset allocation and investment strategies achieved solid results for our clients. Apparently, what did matter were, in our opinion, missteps in communications by the new Fed Chair on interest rate and balance sheet policy, an attack on him by our President, a take back by the President of what seemed to be progress in talks with the Chinese, and the realization of the obvious — that corporate earnings would likely grow in 2019 but at a much slower pace. 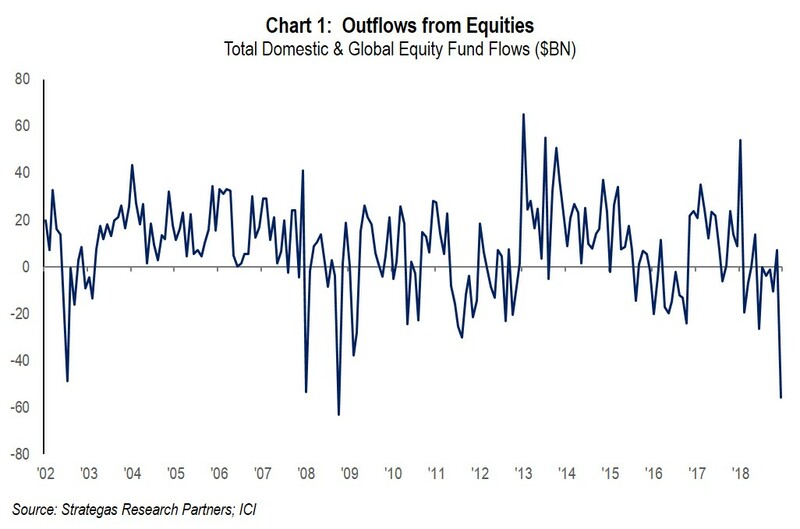 In our opinion, these factors, and probably others, led to the largest one-week outflow from equities on record, even greater than in 2008/2009! This makes no sense to us given underlying fundamentals and the strength of our banking system. 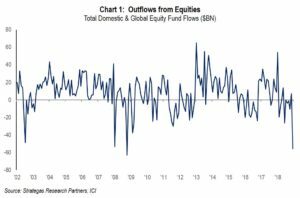 We believe that withdrawals from ETFs and index funds (passive investing) is what contributed to the widespread decline irrespective of quality, earnings growth, or dividend increases. 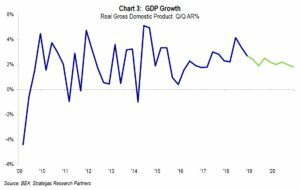 It just seems strange to us that record outflows (See Chart 1) would occur when earnings growth is projected to continue and GDP growth also continues, albeit at a slower pace (see Charts 2 and 3). 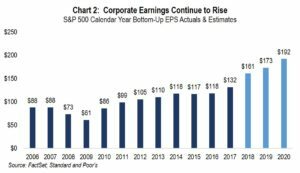 So, without repeating what we spoke of in our annual thought piece, the economy and earnings remain moderately strong while stocks were taken to the “woodshed” in the final quarter of 2018. 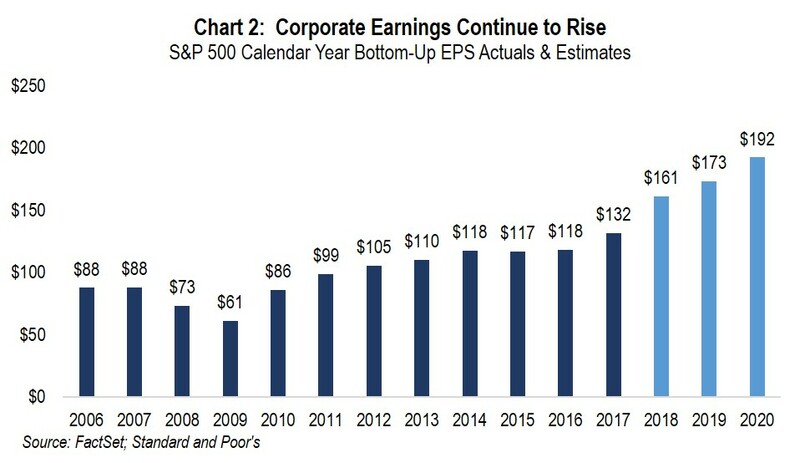 The result being a below average P/E on 2019 projected earnings. Additionally, volatility picked up in the fourth quarter. 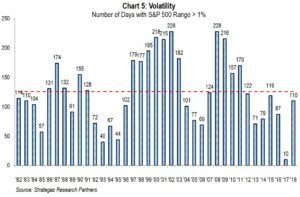 In numerous quarterly reports we have warned of increased volatility. Well, it is here but in Chart 5 below you can see that volatility is normal, and where we came from was abnormally low. 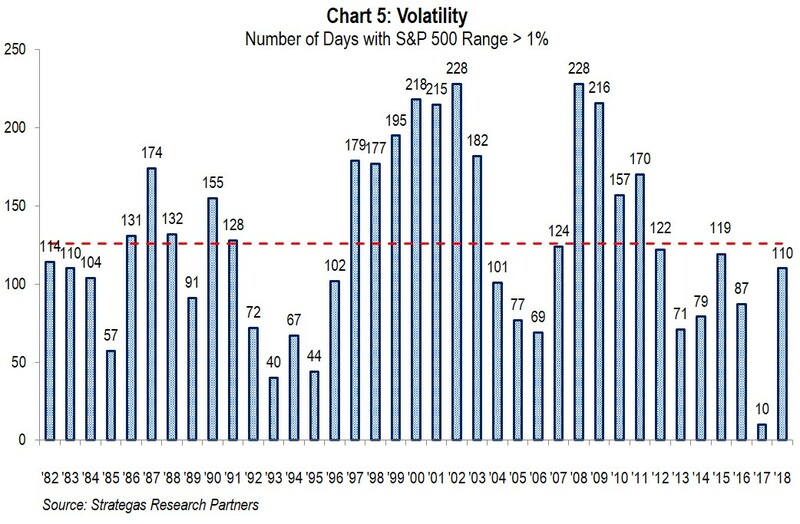 By the way, the increased volatility, if it continues, should help one of our defensive equity strategies. The fourth quarter was very difficult for most investors. Equities sharply declined wiping out three quarters of gains for the S&P 500 and then some while short-term interest rates increased while longer-term bond yields declined. Oil prices declined, we believe because of oversupply, which will help consumers and many businesses (acts like a tax decrease). Valuations are now far more reasonable going forward; some would argue cheap when considering where interest rates are. However, looking forward we now have a split government, a President and his campaign under investigation, key cabinet members departing, a partial government shutdown, and a Chinese trade war still evolving. 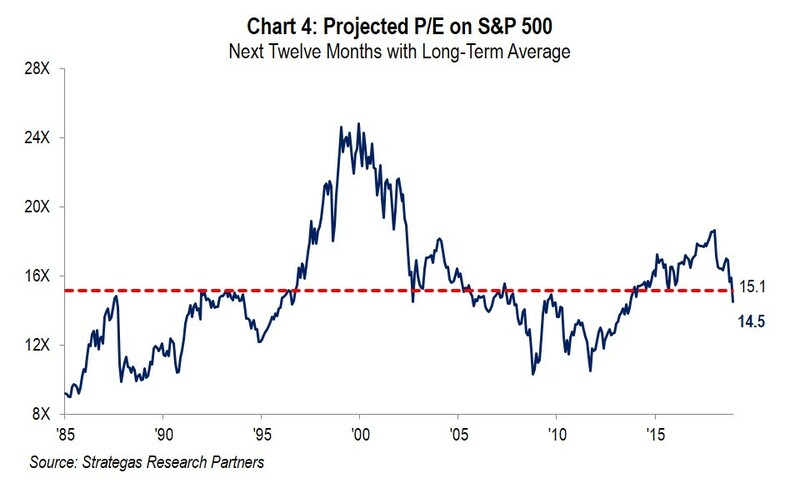 This is a prescription for more volatility while economic fundamentals remain quite reasonable, for now. 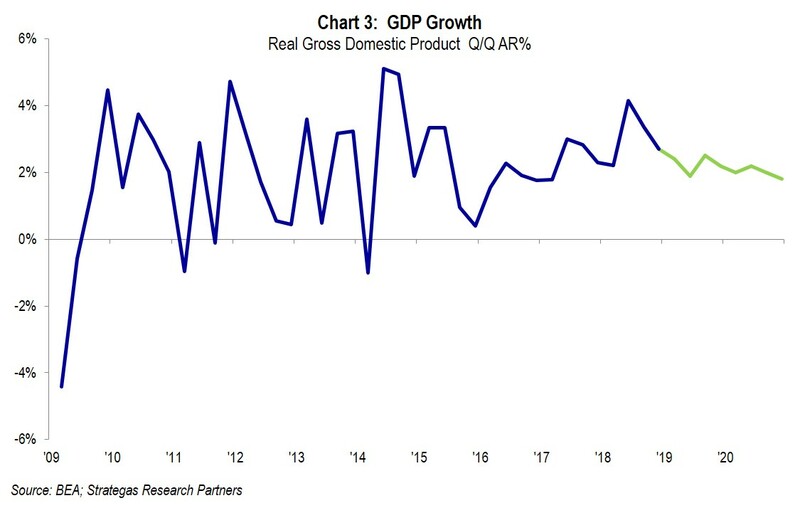 We as a firm still do not see a recession for 2019. That is a positive in our opinion. We will be watching the fundamentals which we continue to believe will reward us as long-term and PATIENT investors. Just think about the impact of we or you having panicked the day or so before the Dow appreciated by over 1,000 points. Prudent asset allocation is our path to withstanding these periods of extreme volatility while prospering over the long term (the last several years have been good to us), and being patient to achieve the sweetness of the bitter environment we have just endured. We hope you will join us on Thursday, February 7th at 2 PM EST for our web seminar where we will discuss our overall outlook for 2019 and how we are recommending clients portfolios be allocated for long-term results. The start of the New Year is always a good time to reevaluate your asset allocation and ensure it is aligned to meet your goals. We would be happy to sit down and discuss your individual situation. The views expressed are the views of Robert D. Rosenthal through the period ending January 25, 2019, and are subject to change at any time based on market and other conditions. This is not an offer or solicitation for the purchase or sale of any security and should not be construed as such. References to specific securities and issuers are for illustrative purposes only and are not intended to be, and should not be interpreted as, recommendations to purchase or sell such securities. Content may not be reproduced, distributed, or transmitted, in whole or in portion, by any means, without written permission from First Long Island Investors, LLC. Copyright © 2019 by First Long Island Investors, LLC. All rights reserved.